Say goodbye to the effects of sun damage, rosacea, hyperpigmentation, and more. With the innovative Intense Pulsed Light (IPL™) photofacial procedure, gentle skin rejuvenation is now easier than ever. 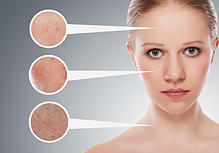 IPL™ photorejuvenation, also called Photofacial IPL Laser Treatment, is the latest in modern dermatology, allowing patients to transform red, blotchy skin into a radiant complexion. If you suffer from any of these problems, photofacial/fotofacial treatments may be the dermatological approach you’ve been looking for. 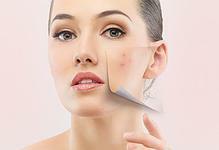 A photofacial is a 30-minute procedure in which intense pulses of light are used to penetrate deep into the skin. IPL™ photorejuvenation then causes collagen and blood vessels below the epidermis to constrict, reducing redness and age lines. The procedure involves only minimal discomfort, while the redness and swelling that sometimes occur after treatment disappear shortly. 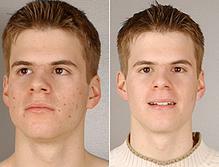 Most benefits of a photofacial/fotofacial occur gradually in the weeks following treatment. People who have blotchy, sun-damaged, or discolored skin, or whose skin is affected by large pores, freckles, or wrinkles, may benefit from an IPL™ photofacial. The IPL skin treatment is also quick and involves no downtime, making it a convenient option for people with busy schedules. Those with dark or deeply tanned skin sometimes experience complications following IPL™ photofacial treatment. People with white, untanned skin that is still somewhat elastic are the best candidates for an IPL™ photofacial. It is also important for patients to have a realistic understanding about what the procedure can do. When performed on the right person, it effectively improves skin texture, eliminating discolorations, reducing pore size, and minimizing wrinkles and fine lines. If you have rosacea, a condition that causes blotchy redness in the face, you may also benefit from this photorejuvenation treatment. For more serious issues – heavy facial lines and severe acne scars, for example – patients may wish to consider more aggressive treatment, such as a face lift or a brow lift. People with tanned or naturally dark skin sometimes experience changes in skin pigmentation after IPL™ photofacial treatment. African-Americans and people of Greek and Italian descent, for example, may wish to discuss possible side effects before opting for this procedure. Additionally, people who are taking the medication Accutane® should not have an IPL™ photofacial until at least six months after they stop using the drug. Pregnant women should also postpone IPL laser treatment until after they give birth. During IPL™ photorejuvenation treatment, high-energy light waves are used to reduce or eliminate many common effects of aging, including facial wrinkles and skin discolorations. IPL™ light also encourages the production of collagen, a natural protein that fills in wrinkles, making the skin smooth and supple. With each treatment, the results of IPL™ photorejuvenation become more pronounced. 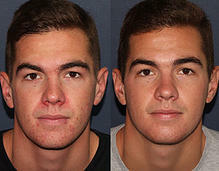 Five full-face IPL™ photofacial/fotofacial sessions spaced three weeks apart are normally required for optimal results. During your Fort Collins IPL™ photofacial procedure at our local med spa, you will feel a warm sensation caused by the handpiece. Some patients liken the sensation to a light “snap” from a rubber band. The number of pulses you receive will depend on the size of the area being treated. Following the procedure, your skin care specialist may help you in icing down the treatment area to help soothe any discomfort from the procedure. This is often unnecessary, however, as IPL™ photofacial treatment causes very little pain. The recovery time from an IPL™ skin procedure is often very short, as there is very little damage done to the skin during treatment. Depending on the skin malady you are seeking to remedy as well as your skin type, the redness that is present following the procedure may persist for a longer or shorter period of time. The side effects of IPL™ photofacial treatment dissipate within a few hours for many patients. For some patients, however, the redness or dark spots may take a week to fade. Patients treated for severe acne sometimes experience longer recovery times, though they are often amazed by the results when the side effects wear off. The most important things to remember following IPL™ photofacial treatment are to avoid the sun for several days and to wear plenty of sunblock for at least two weeks. Intense pulsed light therapy can give you excellent results for a year or more, but you must take care to ensure your skin is protected for the first few weeks after treatment. Often, multiple IPL™ photofacial treatments are necessary to achieve maximum results. Especially if you are seeking to remedy multiple problems – for instance, if you are seeking to improve skin texture and reduce redness – multiple treatments affecting different layers of the skin will likely be needed. Your skin care specialist can help you find out how many IPL™ photofacial treatments you may need to achieve your cosmetic goals.